Mint is named after the Greek nymph "Minthe" in ancient mythology. She was an extremely close friend of Pluto which rather angered Pluto's wife Prosperine. As you do when you loose your temper, Prosperine changed Minthe into the mint plant because it was so often walked on! Pluto was none too happy about that but couldn't undo the spell. Instead he gave mint the ability to give off a delightful scent when crushed. That's enough of the mythology surrounding mint, on to the real gardeners stuff. 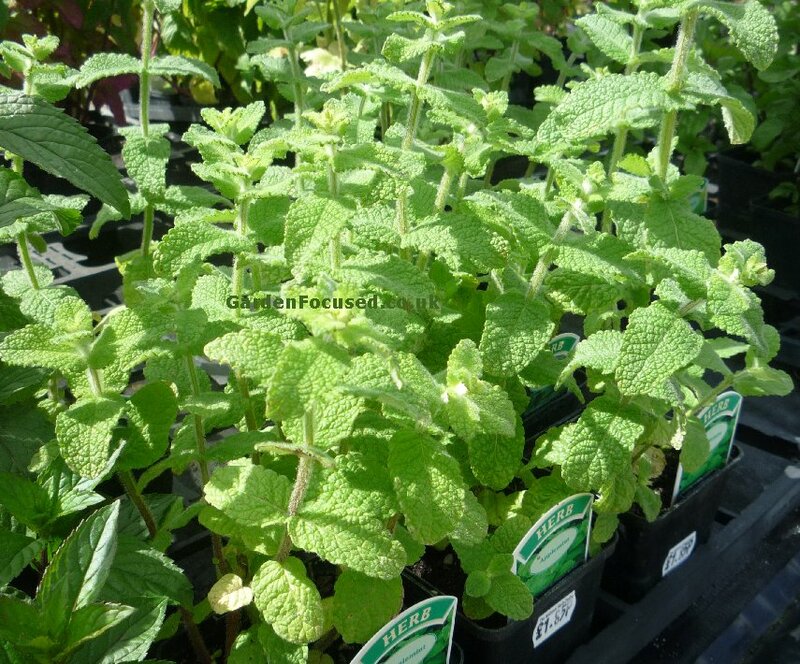 MINT IN CONTAINERS OR OPEN GROUND? There is a very simple answer to that question, always grow your mint (whatever the variety) in a container on its own. Mint grows by sending out roots which are mainly just below ground, a bit like clover. Mint does this very successfully and can colonise huge areas if left to its own devices. It is far stronger and quicker growing than almost all herbs and is quite capable of smothering many weeds. When mint has colonised an area it is very difficult to remove because even small portions of the root will grow into a new plant. Good news if you want to propagate them, but not if you are trying to eradicate them. As far as the compost is concerned for mint grown in containers we have always grown it normal multi-purpose compost. We have also asked the National Herb Centre what they use when growing their mint in containers and they also use multi-purpose compost. The best size of container depends really on how much mint you want to grow. A minimum size of 15cm / 6in up to as large as you want. The container doesn't need to be deep because mint roots exist very near the surface, although a deep container will dramatically reduce the need for watering in dry conditions. 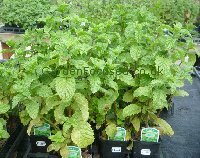 It is quite possible to sink container grown mint into the surrounding soil if you prefer it to look more naturalised. The roots are unlikely to go deeper than 10cm so even a shallow container should be enough to contain your mint plant. Picture below is Tashkent Mint. If you want to propagate your mint from another plant then it's simplicity itself. April to mid June is a good time to take mint cuttings. Simply burrow a few inches below the soil surface of the donor plant and gently pinch or cut off a piece of root with some foliage also attached. Place the root in a new pot of multi-purpose compost to about the same depth as previously growing and water in well. Place the pot in a light and protected position which is not in direct sunlight. They need light but too much sun will dry them out too quickly. Keep the pot moist but not waterlogged. Your chances of propagating mint is very high, they tend to grow too vigorously rather than too little. The root cutting will have taken in the soil after three weeks or so. In the open ground mint is fully hardy in the UK. Even if a severe frost looks like it has damaged it, don't give up, wait until spring and almost certainly the roots will produce new foliage growth. 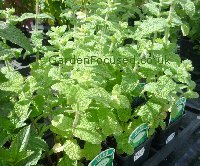 Mint in pots is also very frost resistant although in very cold periods and in cooler areas of the UK it may well pay off to move the pot to the side of a heated house or a garage / shed for a short period of time. The lack of light in the winter will do them no damage. 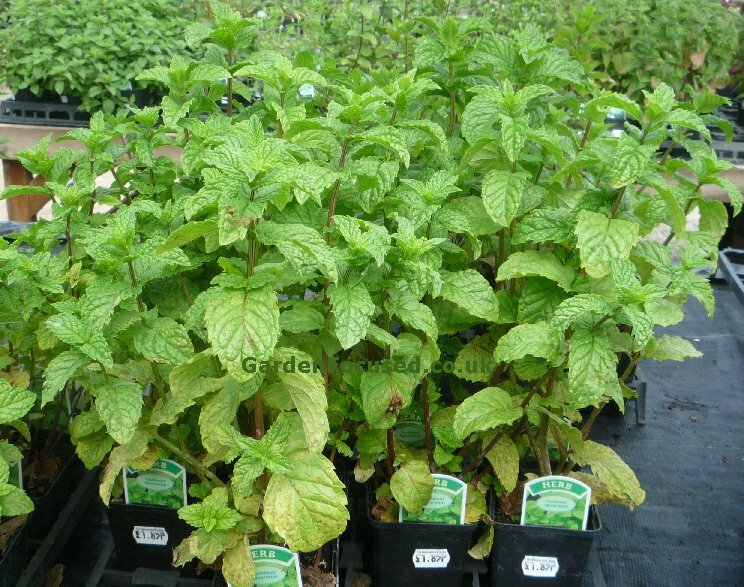 Mint is a herb which can stand lack of feed and drought extremely well even when in pots. When grown in open ground it requires no attention. When grown in pots we feed it with a sprinkling of blood, fish and bone in April and again in September. Water well when the surface of the soil dries out. If you are going on holiday simply put your pot of mint in a shaded, protected position after watering well. It will almost certainly last two weeks without any attention whatsoever. There are endless varieties of mint all with their own particular fragrance and texture. It does make you wonder exactly when you would use some of them, pineapple mint for example or grapefruit mint. The classic mint flavour which has been used for thousands of years. Typically used as a mint sauce for lamb as well as flavouring peas and potatoes. If you only want one mint plant this is the one you need.